Friday marked the 3rd Annual Grand Junction Off-Road Presented by U.S. Bank. The change of date from Labor Day was accepted with open arms as thousands descended upon Colorado's Western Slope to enjoy a weekend of backcountry mountain biking, live music, and solid vibes. 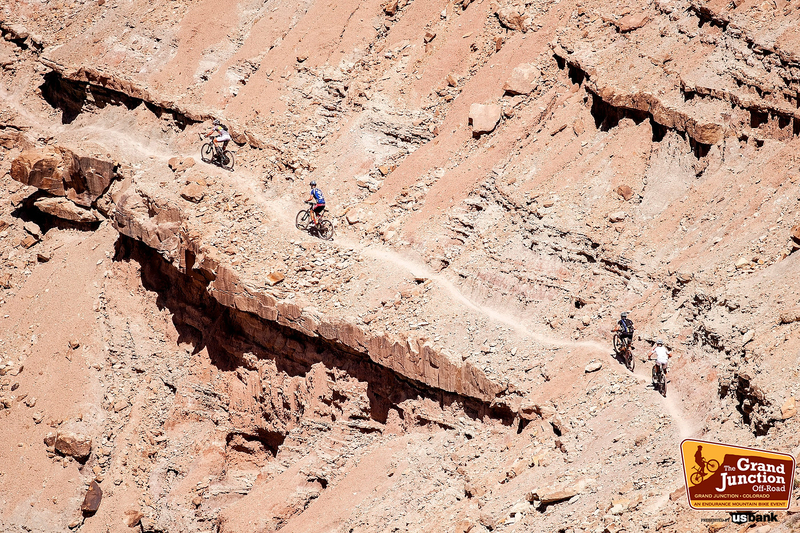 With sunny skies and temperatures hovering in the mid 70's throughout the weekend, it was a welcomed forecast for what has been an otherwise challenging spring for Colorado mountain bikers. The Bike and Gear expo opened at high noon on Friday with over 35 vendors, including Pivot Cycles, Stan's NoTubes, Maxxis Tires, Shimano, Subaru Adventure Team, Sierra Nevada MRP, KMC, Goal Zero and more. 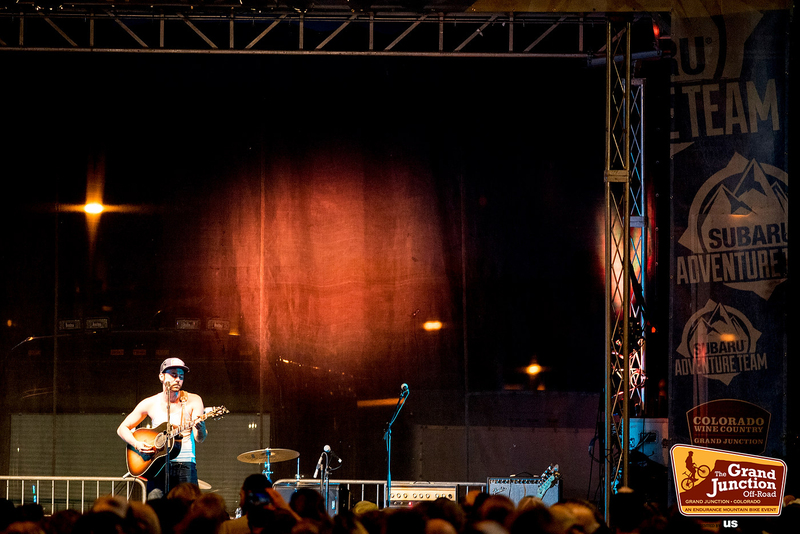 New for 2015 was the integration of the Grand Junction Downtown Art and Music Festival, bringing with it 20 free, live concerts on four different stages, all within a four-block-long Sierra Nevada Beer Garden. With Subaru Adventure Team as the title sponsor of the community concerts, the level of talent attracted to Main Street was impressive. From Thursday's "Drop-In Party" headliner, James McMurtry at Kannah Creek's Edgewater Brewery, to Friday evening’s acts including Changing Lane Experience and Big Sam's Funky Nation, music lovers and mountain bikers were provided an audible unicorn as concert-go'ers danced late into the evening. 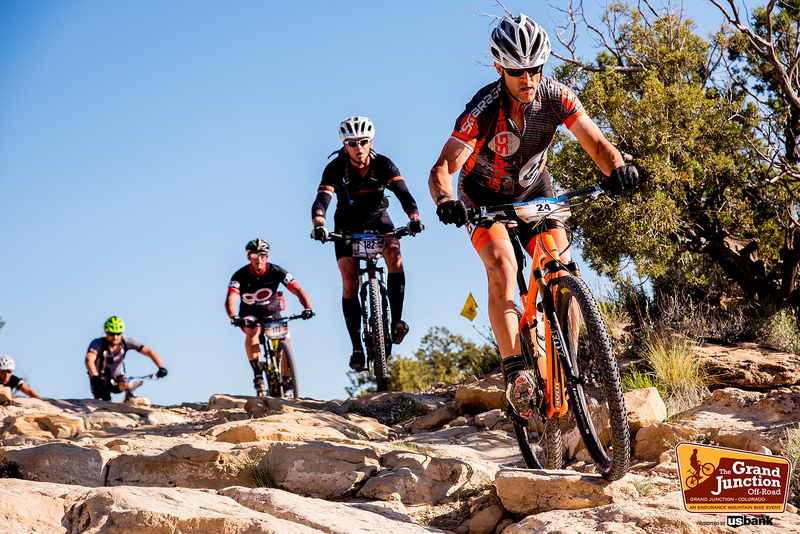 The 15 Grand Fun Ride gave riders a good glimpse of what the Grand Junction trails community has to offer with a ride from downtown to the Lunch Loops trail system. First up, then down Andy's Trail, all seemed to be in awe upon crossing the finish with a ride to remember. 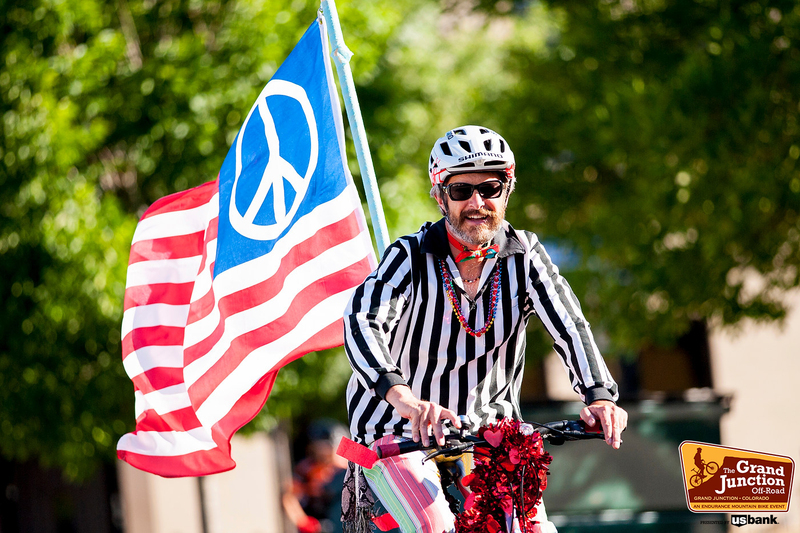 Back in town, the Grand Junction cycling community came out in force yet again at the Klunker Crit. 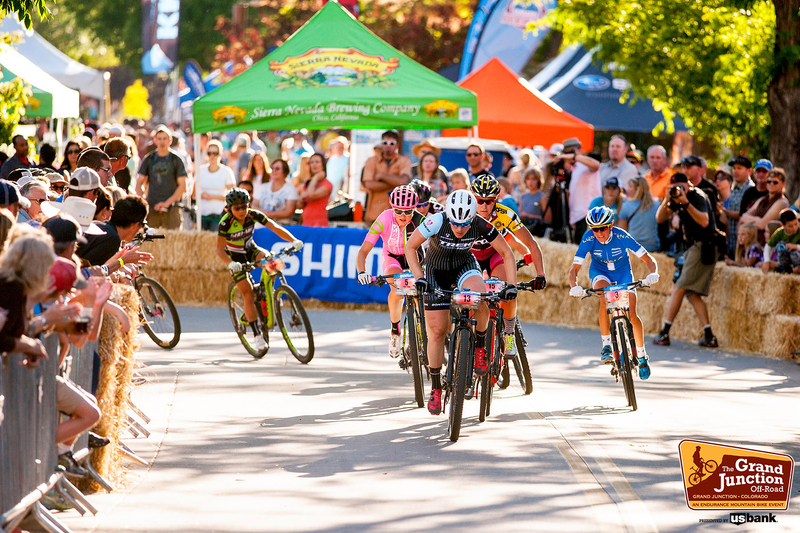 Over 100 riders, dressed to the nines, took to the pro men's and women's Fat Tire Crit course for some loops of their own. Blazing past the Subaru Adventure Team Impreza Stage along spectator-lined streets, it was the party on bikes the community has come to love. Shortly thereafter, a high caliber field of pro men and women took to the course to battle for starting position for Sunday's Pro Race. Katie Compton (Trek Factory Racing, Bontrager, Shimano), Meredith Miller (Noosa Yogurt, ENVE), Amanda Miller (Boulder Cycle Sport, Yoga Glo), Amy Beisel (LIV Co-Facotry, SRAM, OSMOnutrition), and Rose Grant (Stan's NotTubes, Cannondale Bicycles, Griggs Orthopedics Performance) rounded out the top five for the women in a highly contested race. On the men's side, it was all Jeremiah Bishop (Topeka Ergon, Canyon Bicycles), who made a big move in the final laps to put a sizeable gap between himself and the pack. Rounding out the podium was Mitch Hoke (The Pros Closet, Kenda, Stan's NoTubes), Ernie Watenpaugh (Jack Daniels, Telluride Venture Accelerator, BMC Bikes), Bryan Alders (Training Peaks, Yeti, Pactimo) and Benjamin Sonntag (Clif Bar, Niner Bikes, SRAM). View Full Fat Tire Crit results. Saturday was a good day on (then off) the bike for thousands of adventurous, backcountry riders/fun seekers on day two of the Grand Junction Off-Road. With bluebird skies and pleasant temps all day long, over 400 riders took to the world-class 30 and 40 Proof courses at the crack of dawn. A laid-back rollout from downtown Grand Junction to the nearby Lunch Loops trailhead allowed for a warming of the legs before riders tackled the first of a few prominent climbs throughout the day; an exchange of sorts for the impending ecstasy that would be felt on each of the course's stunning downhills. 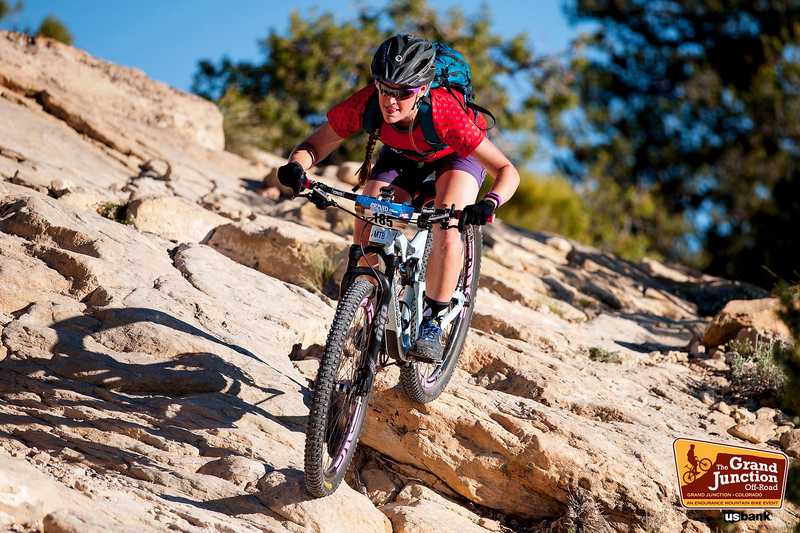 Post-ride, the Bike and Gear expo was the place to be, offering all the ingredients for fun throughout Downtown Grand Junction. With a full demo line-up from Pivot Cycles, free sealant refills from Stan's NoTubes, slow races with Maxxis Tires, glimpses of greatness from Shimano's new (and unreleased) XT M8000, an enthusiastic Car Packing Challenge with the Subaru Adventure Team, and cold, delicious suds from Sierra Nevada, there was no shortness of things to see and enjoy while strolling downtown's picturesque Main Street. Music kept the eardrums happy all day with a series of free concerts, headlined at 8pm by Austin singer-songwriter, Shakey Graves. Recently nominated for three Americana Awards, thousands came out to sing and dance into the night at the free community concert sponsored by the Subaru Adventure Team. View to full amateur results.